The last VOA Radiogram is this weekend. 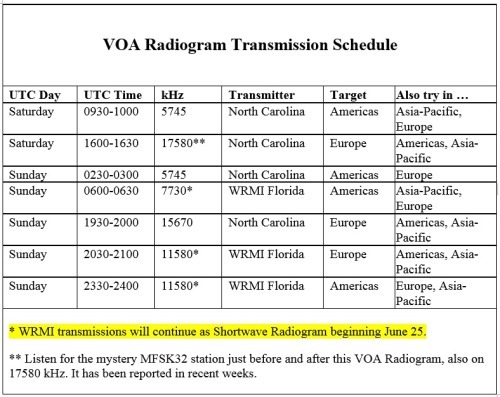 The successor to VOA Radiogram is Shortwave Radiogram, which will be broadcast for the first time on 25 June on the WRMI times and frequencies in the schedule below. This weekend’s VOA Radiogram will be all MFSK32 and will include seven images, including one optical illusion. The Mighty KBC transmits to Europe Saturdays at 1500-1530 UTC on 9400 kHz (via Bulgaria), with the minute of MFSK at about 1530 UTC (if you are outside of Europe, listen via websdr.ewi.utwente.nl:8901/ ). And to North America Sundays at 0000-0200 UTC (Saturday 8-10 pm EDT) on 9925 kHz, via Germany. The minute of MFSK is at about 0130 UTC. Reports to Eric: themightykbc@gmail.com . See also http://www.kbcradio.eu/ and https://www.facebook.com/TheMightyKbc/. 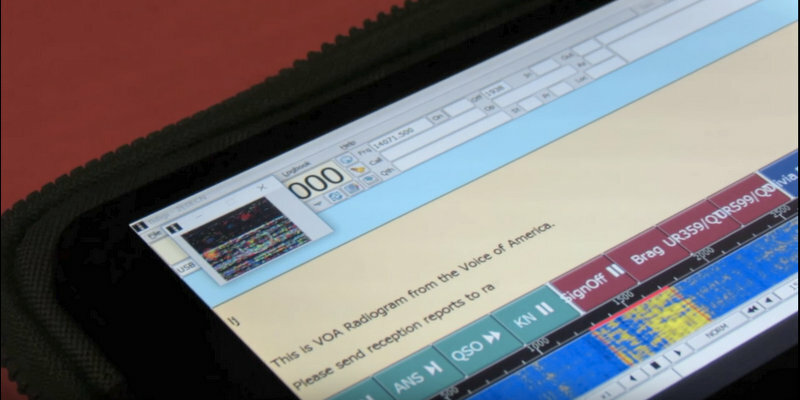 Thank you for your support during the four-plus years of VOA Radiogram! This entry was posted in Digital Modes, News, Schedules and Frequencies, Shortwave Radio and tagged Dennis Dura, Kim Elliott, Shortwave Radiogram, VOA Radiogram on June 18, 2017 by Thomas.